Here in Toronto, we are fortunate to have access to many artisanal bakeries. Some of them operate out of their own premises and others can be found at the many Farmers’ Markets across the city. Such is the demand for quality bread that a number of them also have shelf space inside our local supermarkets, albeit at a premium price. My first attempt at bread baking was about forty years ago in school. As an adult, I have tried out new recipes once in a while, but eight minutes of kneading for one whole-wheat loaf really tests the limits of my endurance. Also, despite my hard work and perseverance, the results were frustratingly inconsistent. 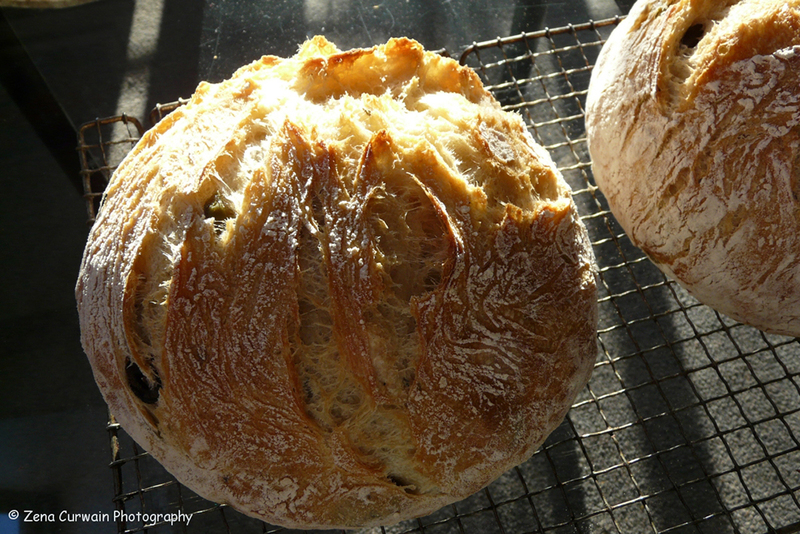 My experience of homemade bread completely changed the day that my partner, Robert, discovered the No-Knead Bread recipe in the New York Times. This dough is amazing, adaptable and forgiving. You mix it up in a bowl using a spatula or wooden spoon, cover it with plastic wrap then walk away for over twelve hours. 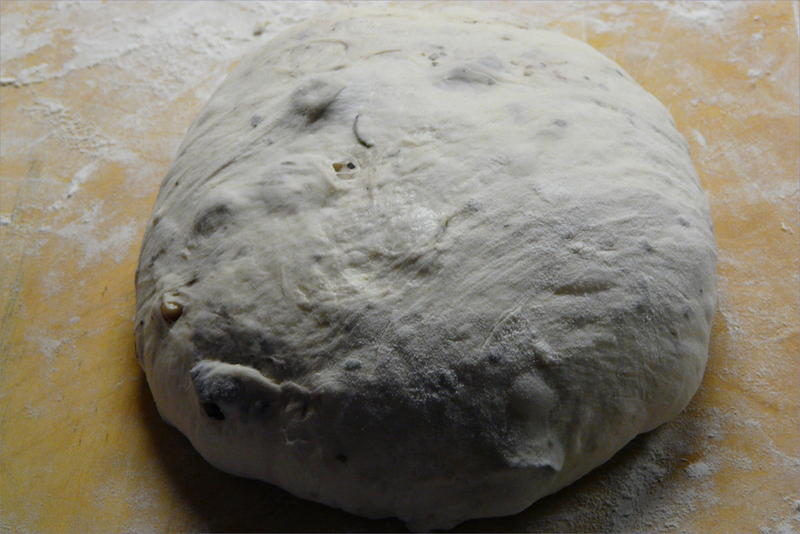 We tend to do this in the evening, leaving the dough to rise overnight. 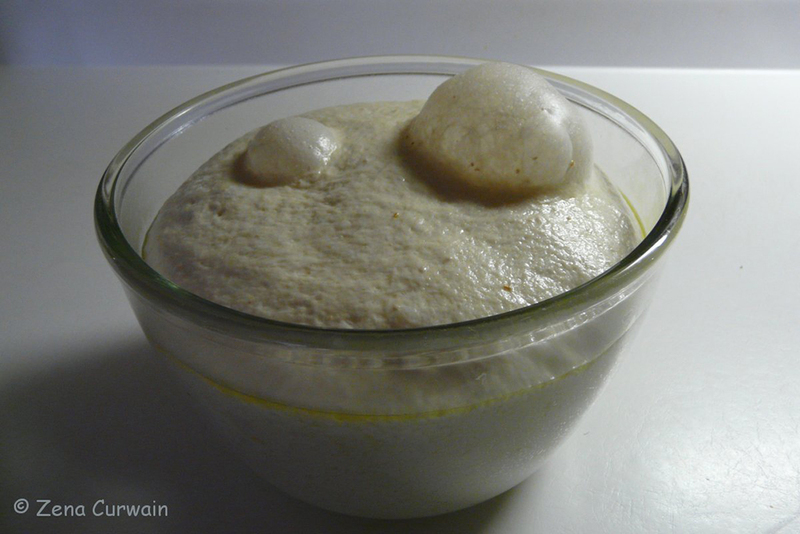 This is plain white dough in an oiled bowl, nicely risen. 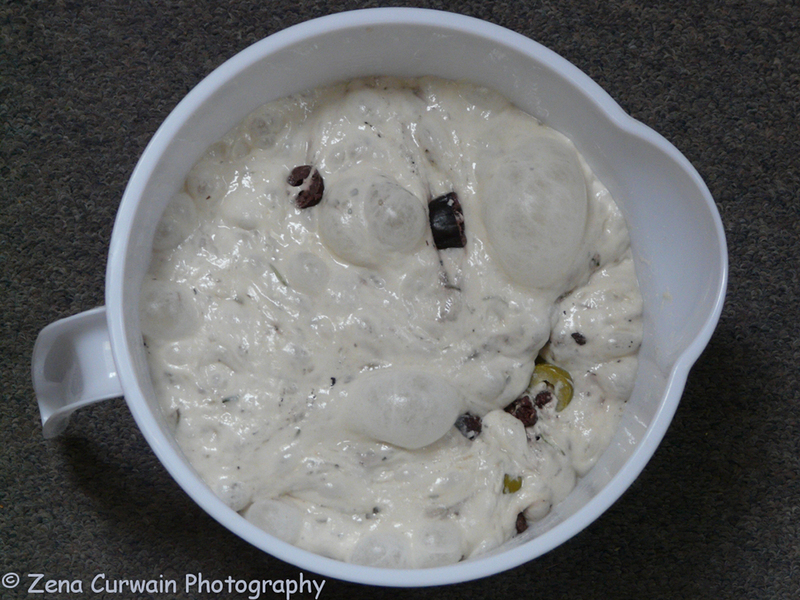 This is dough for an olive loaf. In the morning, we turn the dough out onto a floured board, fold it three times, and then leave it to rest for 15 minutes. There’s time for breakfast or a cup of coffee before you have to touch it again. The next step is to shape your loaf, then leave it to rise for another couple of hours. 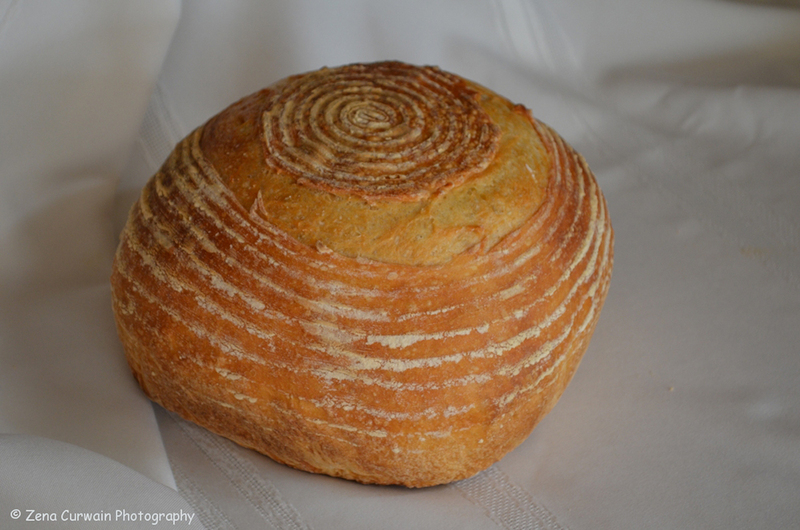 If you’re going to make a boule, you leave it, covered, in a floured basket. If you want a standard loaf, you roll up the dough tightly and place it in a well-oiled 9″ x 5″ pan. If you decide to try the Sullivan Street Bakery No-Knead Bread recipe, I recommend that you start with a white loaf, just to get the feel of it. If you wish to make a variation, such as brown bread, a seed loaf, or rye, you can substitute some of the flour, but not much more than about 1/6 of the total = 1/2 cup. 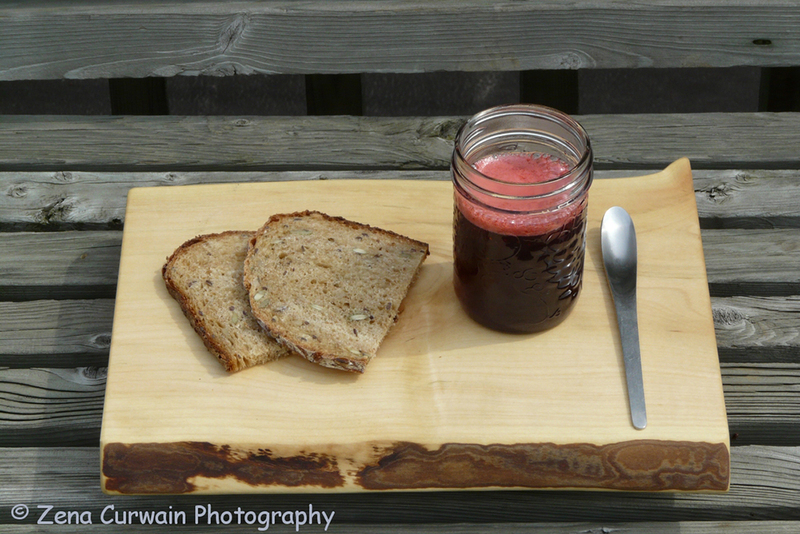 The recipe calls for 1/4 tsp instant yeast, but we have been using 1/2 tsp dry active. When we are making boules, we use 3-litre covered casseroles. We also tend to bake two at once, side-by-side, making more efficient use of the oven. 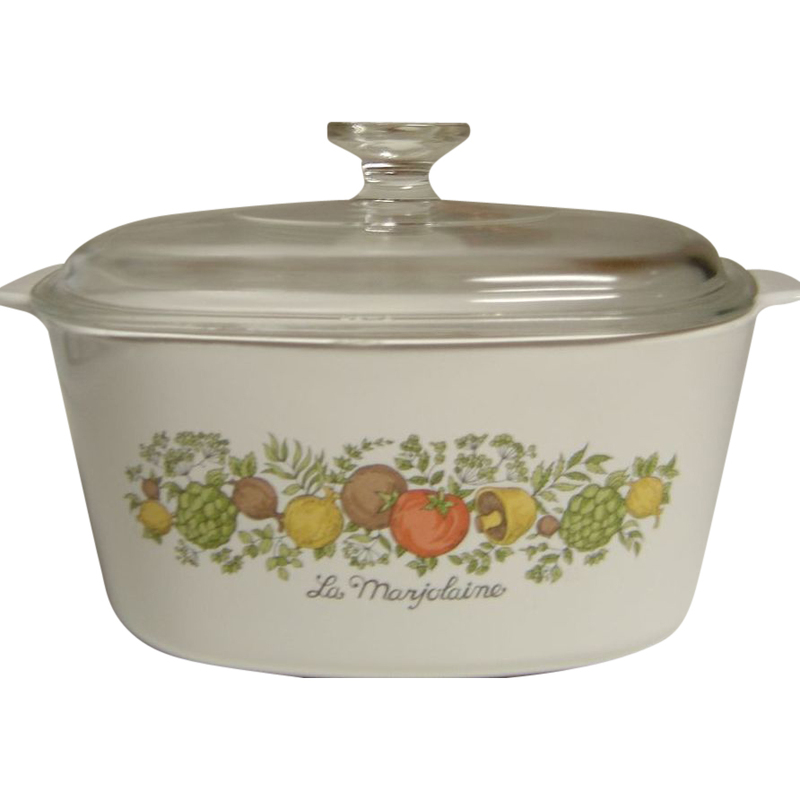 The heated lidded casserole replicates the effect of a professional steam-injected oven, giving you a beautiful, crusty loaf. My personal favourite is a seed-bread variation that Robert created, which we bake in the covered casserole. It’s a dense boule with a crusty exterior. [Recipe follows]. 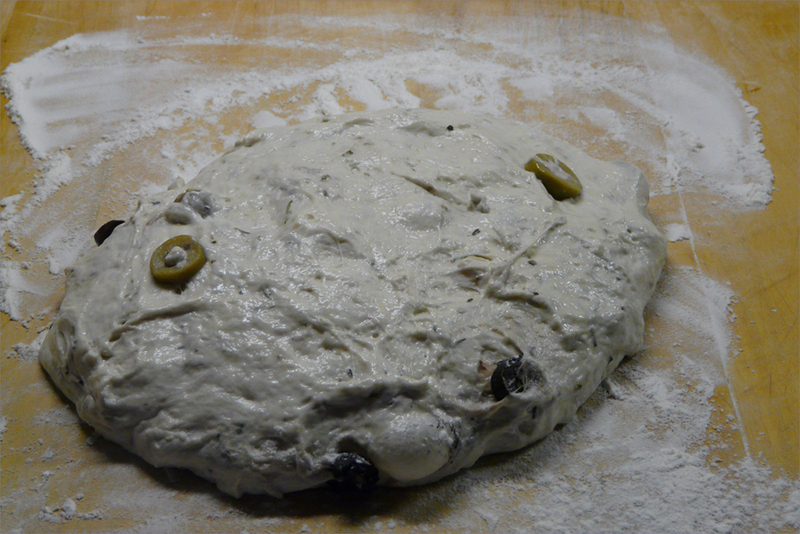 The next favourite is an olive loaf, which is the basic recipe, with 1/2-cup olives and some rosemary and oregano. For over six years, we have not had a single bad experience, and the only time we buy bread now is when we’re on holiday, and don’t have access to a stove. 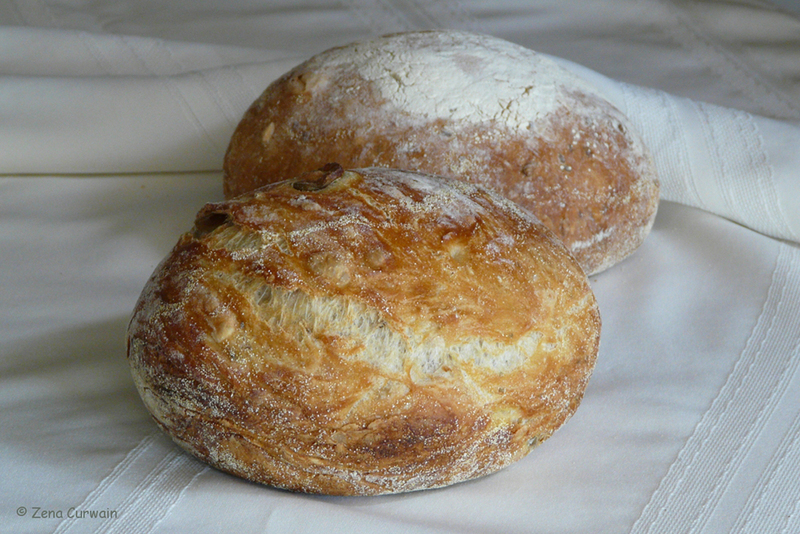 One quantity of dough yields a single boule or a standard loaf. If you decide to split the recipe, you have enough for any of the following: two baguettes, three pizzas, one dozen rolls, or a dozen small bagels. There is no shortage of online resources if you decide to take up the challenge. For inspiration, watch the New York Times video or take a look at The Fresh Loaf. Blend dry ingredients in bowl. Add molasses blended with warm water and mix quickly but thoroughly. (If the dough seems wet, the bran and cereal will absorb the excess during the rising.) 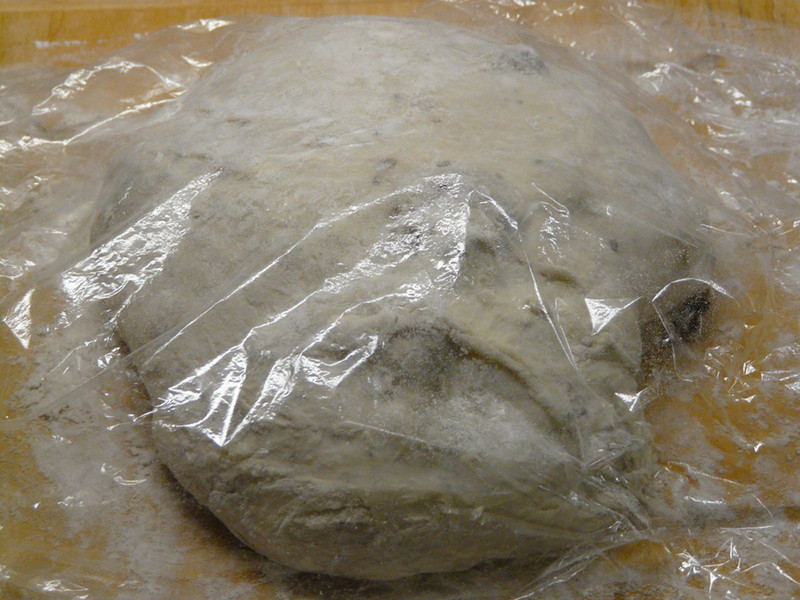 Cover with plastic wrap and let rise for 12 to 18 hours. Turn dough out onto well-floured counter. Sprinkle liberally with more flour and pat our into roughly 12 inch rectangle. Fold in thirds top to bottom and left to right, cover loosely with plastic wrap and let rest for 15 minutes. Dust hands with flour and turn and tuck dough into a ball. Place ball seam down onto a floured cotton tea towel that has been sprinkled with additional bran, sunflower seeds, or sesame if desired. Cover with towel and allow to rise for 2½ to 3 hours until doubled in bulk. Half an hour before dough is ready, place a 3 – 4 quart ceramic or cast iron casserole with lid in oven and preheat to 500F. Turn ball of dough into hot casserole (seam side up), cover with lid, lower oven temperature to 475F and bake for 30 minutes. Remove cover, lower the heat to 375F and continue to bake for an additional 6 to12 minutes or until well browned and bottom sounds hollow when thumped. Cool thoroughly on a rack before slicing.